Arrived at L&D and was sent to Triage for the shot and fetal heart-rate monitoring. Monitoring should have taken only 20-30 minutes (the nurses words were, “we should be able to get you out of here by lunch!”), but an hour went by…and then another hour…and then the nurse informed me that she had been watching the monitor and was concerned about the way they were reacting to contractions. She called my doctor and my doctor ordered that I stay overnight for further monitoring. I was taken by surprise, to say the least! I notified Joey and my family quickly as they were prepping me to get admitted into the antepartum unit at L&D. I was put in a gown, greeted by nurses with all manner of consent forms to look at and sign, and given the menu to order some food. This part was the most surreal part to me; even though I convinced myself that this was all fine, the babies were going to stay put at least for another week (which was my goal, 36 weeks), I was going to be sent home by lunch the next day…but the forms (consent forms you usually sign right before you have your babies, just in case), language the nurses were using (when I clarified to one of them that I was going to be kept until the next day–I was still processing all of it–she said “at least!”), etc. were pointing to what was ultimately reality: they were coming soon! Joey left work early, went home to pack an overnight bag for us (because, of course, I was just being kept overnight!) (also of note: I had not packed my hospital bag yet) and finally joined me around 5 or so. While I waited for him, I signed aforementioned forms, got hooked up to an IV, and called and texted my parents to explain the situation and make arrangements for Arden and Jane, for the night. My parents came and visited me with Arden and Jane, and I’m SO glad they did, because I was able to get this adorable picture of us–the last one with them before the twins arrived. A Nurse Practitioner from the NICU came to talk to us, at the recommendation of my doctor, to prepare us for the possibility of a NICU stay if they were to come early. I am so glad that my doctor recommended this — she’s the best! — because it made the eventual NICU experience less daunting. She walked us through what 34/35 weekers usually go through and was very honest with us about what to expect. Ultimately, they only stayed in the NICU for one week, which was lower than what they told us to expect, which was more like 2+ weeks. She introduced us to terms like “CPAP” and lung surfactant and prepared us for the reality of not getting to hold them for a few days. She answered all of our questions and was super helpful overall, as we were to find all the NICU nurses are! I can’t say enough how great of an experience we had with all of our nurses and doctors. We settled in for a night of hopefully getting some rest. Unfortunately I did not get very much sleep; I was SO uncomfortable because the position I had to lay in in order for the monitors to pick up the babies’ heart rates was uncomfortable, and I couldn’t really move around a whole lot. Being on the other side of the end of the pregnancy, I realize just how much in pain I was at that point. Walking, sitting, and pretty much any kind of moving was all very painful. I had gotten so used to it that I was a little desensitized, but now that I feel normal again I can see the contrast. Staying in the hospital in that state for a week would have been very difficult. In the middle of the night a sonographer came in to conduct an ultrasound to look at the babies more closely. Apparently Clara had another prolonged deceleration. She said everything looked normal and then went on her way. There was never really an explanation for why her heart rate kept decelerating! Around 2am I got desperate and I had to ask the nurse for some medicine to help me sleep. Woke up the next morning to news that their heart rates were pretty stable throughout the night, so I relaxed and ate some breakfast. My doctor came in and talked to us, saying that though things were looking good right now, she wanted to have a serious talk with us about having a c-section sooner rather than later. She explained that though this was not an emergency situation, at this point at 34 weeks and 5 days, where their chances of doing well outside of the womb were very high, the chances of the situation turning into an emergency pretty quickly (say if Clara’s heart rate dipped and did not come back up) were growing. She told us to talk it over and decide what we wanted to do, if we were comfortable going through with a c-section sometime over the next couple days. Joey and I talked and prayed about it, called our parents, and decided that we trusted our doctor’s wisdom. At this point, I began to really believe that they were coming soon–I just didn’t know how soon. At this point, we decided it was probably a good idea to go ahead and get some bags packed for a longer hospital stay. So, I texted Joey my (very long) list of stuff I needed him to round up for me, and he headed home to get it all together, and for an hour or so I had some time to myself. Then came one of my favorite memories from the day: I took time to process what was happening and ended up reading Psalm 121. I’m so glad that I did because this Psalm was of great comfort to me during the c-section. Things had been pretty quiet for a few hours after talking to my doctor. I got my next steroid shot 24 hours after my first one, and they felt that it was safe to go ahead and order some lunch (they had been unsure whether this was wise, since before a c-section you are not supposed to eat). So I ordered lunch and let the family know to not expect anything exciting to happen today. Well, things changed pretty quickly after this. Literally right before my lunch was getting carted in a couple nurses came in looking concerned. They were watching the babies heart rates and didn’t like what they saw, so they went to call my doctor. They told me to hold of eating lunch for now until after they talk to her. Before I knew it, they were putting an oxygen mask on me and preparing me for the idea of a c-section that afternoon. My doctor came in in a hurry and explained that Clara was showing signs of distress yet again after a few hours of stability. She made sure that we were comfortable with going through with the c-section (as opposed to being put on pitocin and trying a vaginal birth, but the risks of ending up with a c-section anyway based on Clara’s heart rate was high so we declined) and then all of a sudden I was being prepped! Everything happened really quickly, so quickly that I didn’t even have a chance to personally text my family; I had to have Joey do it. I’m so thankful that at this point I also remembered to have Joey grab the camera. I had to walk him through how to get it put together and how to use it real quick. The prepping for surgery/being wheeled to the OR was a blur, and it was all I could do to just focus on my breathing and remember what I had just read: The Lord is your keeper, your shade at your right hand; he who keeps you will neither slumber nor sleep, he will keep your life… After the surgery, my doctor and the nurses all commented on how well I did during the whole process and how calm I seemed. This is amazing to me because I did not necessarily feel calm. It was a surreal experience, that after all the months of the pregnancy and all that it entailed–the sickness, all the appointments and sonograms, the aches and pains, frustrations, fears, sleepless nights, etc–was all about to be over. With Arden and Jane, by the time they came (their due dates) I had waited 40 weeks to meet them and I felt SO ready. This time, the (already shorter, 37 week) pregnancy got cut short by 15 days and I didn’t necessarily feel ready. Later I would remark how I wish that I would have had a little more time to have some closure with the pregnancy. For instance, I regret not taking one last belly picture that day. It seems a little silly now, being over a month into having the twins, to wish that I would have had more closure with it– because ultimately I was so glad to not be pregnant anymore when they came– but this is just the way my crazy mind works :). There is a great chance that this was my last pregnancy so in some ways I felt like I needed more time to acknowledge and honor that. Well, so as I was “acknowledging and honoring” the last minutes of my pregnancy (it’s okay to laugh :) I was being wheeled to the OR, and then the birthing process began. This time, birthing didn’t involve hours and hours of painful contractions and a long mental battle. The anesthesiologist walked me through getting a spinal block, and that was really the hardest part, over in just minutes. I leaned on a lovely nurse who reminded me to breathe and helped me relax while I arched my back like a cat. He numbed the area then administered the spinal block. After this, it was all smooth sailing. As soon as I started feeling the warm relief swimming through my body I just focused on enjoying the experience of feeling numb after months of pain. It really felt like slipping into a hot bath. It was SWEET RELIEF!! After making sure I was completely numb from the belly down, they let Joey in. Having Joey by my side was the last piece of the puzzle: I was so peaceful and finally felt ready to meet them. Then, in just minutes, the babies were born! It all happened so quickly. My doctor pulled Clara out and in no time we heard cries…and in no time I was crying too :) Joey quickly snapped a picture of her. She was born at 3:36pm. Then, just moments after I had the thought, “I can’t believe I have another baby in me!” Ruby was born, within the same minute! 3:36pm. I felt SO much joy at their coming. I’ve heard some moms say that they felt loopy or out of it because of the drugs, but I felt very clear-headed and happy. The babies were brought to an adjacent room to be weighed and checked– they both weighed 5 lbs 10oz and measured 18.5/18.25 inches (respectively), a very healthy size for their gestational age! 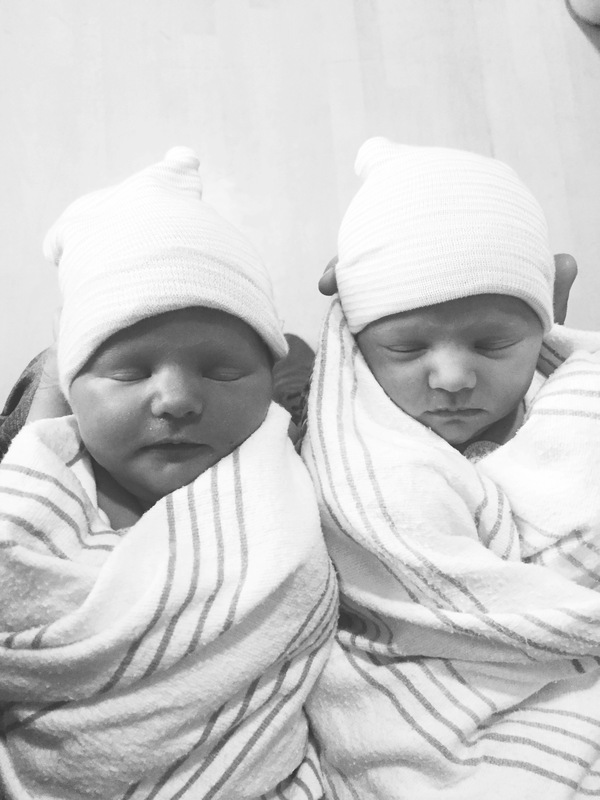 Their immediate Apgar scores were good, both at 9, but after 5 minutes their score dropped to a 2, so they were put on CPAP pretty quickly after they were born, which basically made it less laborious for them to breathe. The babies were put in little covered bassinets and brought to me to see briefly before being brought to the NICU. Joey went with the babies to the NICU and I went to the recovery room, where I would stay for 2 hours while they monitored me and while I pumped milk–just a few milliliters–for the babies for the first time. Since I was the only one in the room they let me have visitors one at a time. My dad came to visit, then Papa, and then my mom. I am so glad I didn’t have to be alone! After the two hours were up, I was wheeled to the postpartum room where Joey would meet me. I was still feeling great…until I got to the room, and I ended up throwing up three times in the next couple hours, a side effect of the spinal block. This was very, very painful because it put a lot of pressure on my fresh incision. It also meant that I wasn’t allowed to eat or even drink any water, and that I would have to wait a little longer to be able to see the babies. But I stayed in good spirits and took some nausea/sleep medication as my nurse recommended. This ended up being the best thing for me – I got a few hours of deep sleep and woke up feeling so much better. Then, in the middle of the night around 1 or 2, I finally got to see the babies! My nurse wheeled me to the NICU and I got to spend some time with them. This was an amazing but also surreal experience for me. I have to admit it was hard to have to meet them like this – all hooked up to wires, not being able to be held or even really touched yet, and having this huge thing on their face to help them breathe – but mostly I was just thankful that they were here and healthy. The rest of our stay in the hospital, for the next four days, was very busy. I spent my time pumping and establishing my milk supply, bringing milk to the NICU, washing and sterilizing pump parts (though Joey mostly did this part), spending time in their rooms talking to the nurses and their doctor, celebrating the progress they made, getting to finally hold them, getting to feed them, and then eventually, we had to be discharged from the hospital and go home without them. This was extremely difficult. I cried the whole way home… I felt like part of me was missing. But, we spent the next three days with them in the NICU, going home only to sleep. And then before we knew it, they were discharged as well with a clean bill of health, and after one week, we finally were able to come home together as a family. Thank you for letting me share this story. I am so thankful for this unique experience, and most of all for healthy baby girls. I’ll post their one month update and a postpartum update soon! Please pray for me as I pray for you. 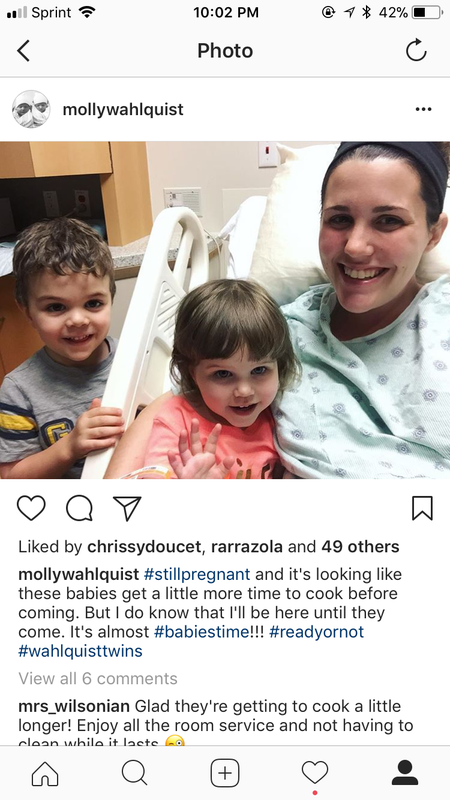 This is the first time I’ve been able to read this- in part because I have my own hangups with c-sections but wanted to say what a dedicated mama you are. I love how you kept the faith- even in the midst off all your emotions and concerns. What a joy those babies are! ← Letter to Arden at 4 1/2 years.